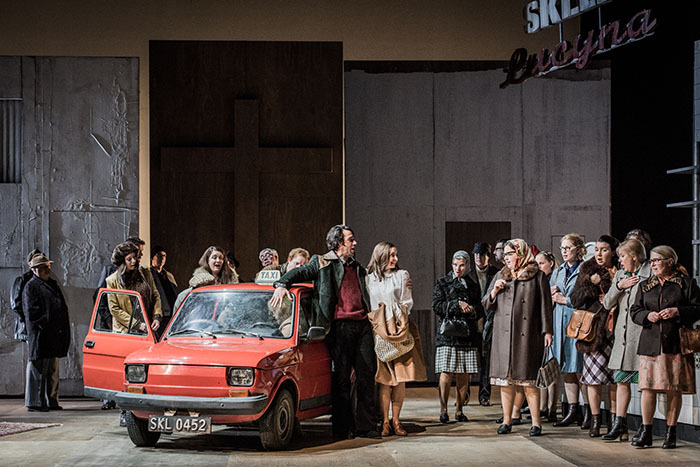 A new production of Cavalleria rusticana, commissioned by Opera North and developed by Polish director Karolina Sofulak, has premiered in the UK. The director set Cavalleria, originally written by Pietro Mascagni in 1890, in her home country during the late 1970s. The updated version presents the protagonists as dissident Catholics mistrustful of Poland’s communist regime. The classic opera, famously featured in such films as Raging Bull and The Godfather III, tells the story of Turiddù, a soldier who returns to his hometown to find that his fiancée Lola has married another man. The play deals with passion, revenge and violence — themes Sofulak found particularly relevant to Poland in the late 1970s, when it was a satellite state of the USSR, and under strict Communist rule. The production, which is visually inspired by the aesthetics and culture of the 70s, featuring the iconic Polish-made Fiat 126 ‘Maluch’. Sofulak was also inspired by Krzysztof Kieślowski and comedies of Stanisław Bareja, as well as by her own family history. Turiddù’s mother Mamma Lucia is loosely based on her grandmother, Lucyna. Cavalleria rusticana premiered on Saturday at the Leeds Grand Theatre as part of its Little Greats season, and will continue until 21 October, before touring Hull, Nottingham, Newcastle and Manchester. The production runs until 21 November.